The Tomioka Silk Mill is an early industrial complex that shows the spreading of Western techologies during Japan's Meiji period. The mill was established in 1872, and it was dedicated to the production of raw silk. This nomination also symbolizes Japan's entry to the modern industrialised world. Production at the mill ceased in 1987. Soon after the Meiji Restoration in the late 19th Century, the Japanese Government hastened the modernization of Japan to catch up with European countries. Japanese raw silk was the most important export and sustained the growth of Japan's economy at that time. However, it was hard to keep up with the quality. With assistence from Lyon (France), the leading centre for industrialised silk production at the time, a modern facility was built with the most sophisticated machinery. 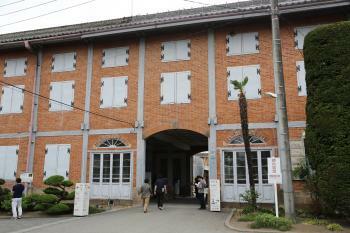 The Tomioka Silk Mill was built during the Meiji Restoration. As you may know the Meiji Restoration refers to Japan in the 2nd half of the 19th century. Japan had been living in isolation for centuries. Due to military incursions by the Americans Japan came to realize that they needed to catch up fast with the rest of the world. While the general industrial advances are covered by the Sites of the Meiji Industrial Revolution Tomioka is focused on one specific factory for silk production. The factory itself was built with support from French engineers. Walking around it does have a colonial feel to it, especially with regards to the living quarters. The site also encompasses three other locations related to silk production and tries to provide a full picture. As these are further off, I did not manage to visit, though. Operations at the site ceased rather recently (1989) and most of the original equipment was preserved. So the site feels authentic and complete. With the very unique focus on industrial silk production I think this is a valuable addition to the list, although a niche one. I visited Tomioka as a stop over on my way from Tokyo to Kanazawa. I had to change in Takasaki where I deposited my luggage at the station. Be aware that the railways from Takasaki to Tomioka is not included in the Japan Rail Pass so you will have to get a separate ticket. From Tomioka Station you can walk. I did not investigate how you can visit the other more remote components of the site. If you are visiting as part of a day trip from Tokyo you should be able to visit at least one more. I visited the Tomioka Silk Mill as a day trip from Tokyo including a visit to the Snow Monkeys 1 hour further away towards Nagano. I haven't seen many industrial UNESCO sites yet and I must say that I really enjoyed visiting the Tomioka Silk Mill. Maybe some would say it's not interesting and I can understand why. There is just a small exibition, one building with the (modern) reeling machines, and everything else can just be seen from the outside. My kids were with me and I could only convince them to join me if we also included the Snow Monkeys in Jigokudani on the Japan itinerary we were following. I drove by car as it was more efficient for the day. Parking is available (paid) just 200 meters from the entrance. As with most place in Japan in found the entrance quite steep but then, they do good maintenance. One of the large storage halls was completely covered and taken apart plank by plank. They really do a good job preserving all as with the reeling machines. Coverd with plastic for the most part! Gave a bit of a sterile feeling. I do understand why it's UNESCO and I think if they open up a bit more of the buildings. Maybe the managers house with furnuture of that time it will make it even more interesting. If you're in Tokyo and want to get out this is a site worth checking out for sure! Visited this site in May 2017 as a pleasant detour from Tokyo (and using some private railway line not subject to the wonderful Japan Rail Pass). The cost was 1,000 yen entrance + 200 yen audioguide and 200 yen conservation viewing desk. The mill was completed in 1872 after local government decided to import mechanized Western technologies of silk processing. Technical advisers from France were invited, while trainees were hired from local female workers. Other factories using Tomioka mill model were constructed around the country afterwards. Introduction of mass production technologies led to modernization of Japanese economy. The mill have been producing raw silk till 1987 when all the reeling machines were preserved in the original state. In overall I liked the whole cluster of buildings, which are interesting mix of colonial style constructions and Japanese traditional design features. Many industrial architectural innovations already known in Europe were first introduced in Japan in this mill. I was lucky to visit on Sunday, when there are various workshops and exhibitions involving demonstrations of how the silk was gathered from the cocoons, very interesting process. The funniest fact about the mill: young female Japanese workers were reluctant to work at the mill, because there were rumours that the French were drinking ... blood!!! All this was because the locals saw French drinking wine, something they never saw before. 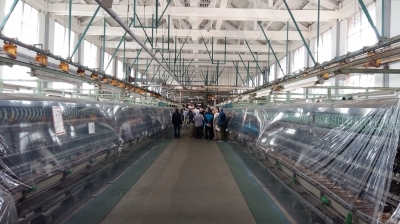 For me the site deserves its status due to unique combination of industrial cooperation at its very beginning, good preservation level and outstanding example of vertically integrated production of silk. 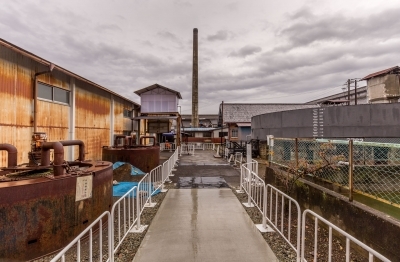 Since the industrial heritage is one of the most underrepresented categories of Asian World Heritage Sites, Japan has started to propose its industrial heritages to fill the gap, Tomioka Silk Mill (Tomioka Seishijou), the first state owned western-styled factory. 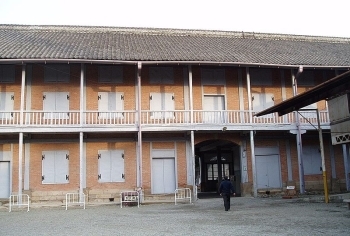 Almost unknown to foreigners, the factory has been a landmark of Gunma Prefecture since the silk mill is quite famous among Japanese especially in school history class. As part of my 2012 Japan trip, I took the Shinkansen from Tokyo to Takasaki and then the private Joshin Line to Tomioka. From the train station, there was a color line on the road show direction to the mill, the same system use in many hospitals! After walked for about 15 minutes, I was at the entrance of the complex of large long brick building. The building turned out to be the eastern cocoon storage, inside there was small exhibition of how to make silk, sadly that there was no English at all. Then I went to see the twin western cocoon storage which was closed for renovation. These two storages were quite the highlight of the mill as they were considered to be the first brick factory building of Japan, the building was done by French and the roof by the Japanese, so it was quite interesting to see the European brick building topped with Japanese tiled roof. After the storage complex, I went to the silk reeling machine hall, the machine were wrapped by dusty plastic sheet, the very surprising and uninspiring way to preserve the machine. After that I walked around the complex to see dormitories and offices building which mostly built in western styled wooden houses as well as nice river side area. Tomioka Silk Mill was a fine place, but nothing special in my idea. The significance of Tomioka seemed to be its status as the first western style factory in Japan and maybe in Far East and as the showcase of country development as well as the story of its workers. Workers of Tomioka were mainly women who worked 7.45 hours a day 6 days a week, an important chapter of Asian female labor history and welfare development. No surprise that the cartoon image of a female worker, Otomi-chan, has been used as a mascot to promote the World Heritage Site nomination. To become a World Heritage Site, there were support posters and stickers everywhere in town, even on some cars. The complex was also under restoration and refurbishment to prepare the UNESCO registration; however, in my idea Tomioka need to do something more to explain the site and its outstanding value. The display was a big problem, the plastic wrap in the machine hall need to be put away, and more English explanation signs. This site has great potential, but a long way to go. In 2014, Tomioka Silk Mill finally has become UNESCO World Heritage Site for its historical importance on Japanese and Asian silk industry. From many news sources there are many development after my visit, especially new modern train station building to welcome an influx of tourists and new traffic control in city center. Since I am not a great fan of Industrial World Heritage Site, most of them are not beautiful nor is appealing to visit, and unfortunately Tomioka Silk Mill is not different from other industrial heritage sites. However I really interesting what will happen with Tomioka as I always impressed how the Japanese develop their tourism marketing. Iwami Ginzan is a very good example of their clever to get tourists' money even mining which is probably one of the most uninspiring sites and lacking of marketing resources. With its easier money generating silk and mulberry theme souvenirs, Tomioka's tourism chance is the thing that I will look for if I have a chance to go back, maybe new kinds of mulberry rice cakes or DIY weaving silk kit!